Living in Hong Kong, 10 year old Choi is told to go home when he arrives at school on the morning of December 8, 1941. The Japanese are bombing Hong Kong amd on the way home, he sees soldiers breaking into shops and homes and taking people away. Afraid, Choi makes his way home just in time to see his mother being led away by a soldier. Already fatherless, Choi is left alone with just his Uncle Kim. Hong Kong was a British colony and on Christmas Day 1941, British and Canadian forces surrender it to the Japanese and leave. Within months, more people have disappeared, food is scarce and people are starving, whole villages are set on fire. To survive, Choi and Uncle Kim head out to the mountains to collect firewood to sell to the Japanese along with Uncle Kim's friend Aaron and his son Taylor. Taylor's mom, who is American, was in the states when the invasion of Hong Kong happened. The two boys take their firewood and sell it to a soldier, Watanabe-san. Watanabe-san is kind to the boys and teaches them Japanese. Within a year, he gets them jobs as "slave boys" at the Japanese military station. Uncle Kim promises to visit him every week, but also asks Choi to listen carefully to what the Japanese soldiers say in his presence. He might hear something important. Taylor is asked to deliver a package across town and when he returns, he tells Choi he has seen his mother scrubbing clothing by hand. Choi asks if he can make the next delivery and he, too, sees his mother and even has a brief conversation with her. He continues to make deliveries in order to see her. One day, Uncle Kim comes to visit and tells Choi about the shortage of medical supplies to help wounded Chinese people. Choi knows where the Japanese keep these supplies and tells his uncle he will get them to help his people. And so Choi and Taylor begin resistance work along with Uncle Kim. But can they get away with it for long under the watch of Japanese soldiers? The answer may surprise you. The story is told in the first person by Choi. The language is simple and clear, giving enough detail of events without being overly graphic. Although this is a picture book, it is for older readers, not young children. And, in fact, since many kids begin to learn about WWII in 4th or 5th grade, it is an ideal choice for use in the classroom. 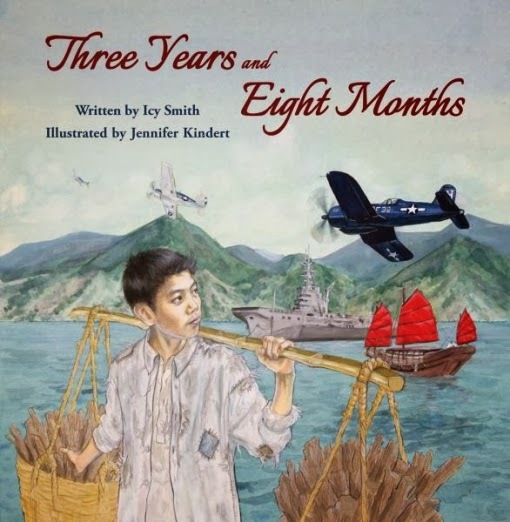 Based in part on the stories her father and grandmother told her about their experiences living under Japanese occupation in WWII, Icy Smith has given us a rare look at what life was like for the people of Hong Kong at that time through Choi, a character that seems to be modeled on her dad. Do read her dedication to them to fully appreciate the story in this book. The title, Three Years and Eight Months, is exactly the amount of time that Hong Kong was occupied. Choi's story is complimented and enhanced by the beautifully detailed watercolor illustrations of Jennifer Kindert. As you study each thoughtful illustration, you will notice subtle touches that broaden the story and tell you more about what life was like then. Choi was only 10 when the Japanese arrived, but was 13 1/2 when the war ended and Kindert has successfully depicted that maturation. At the end of the book, there are five pages of back matter, called Remembering History, that gives more detailed information about life and conditions in Hong Kong, including black and white photos and a map of countries in the Pacific that were occupied by the Japanese. This is a valuable contribution to documenting the history of China in WWII and should not be missed. This book was borrowed from a friend.